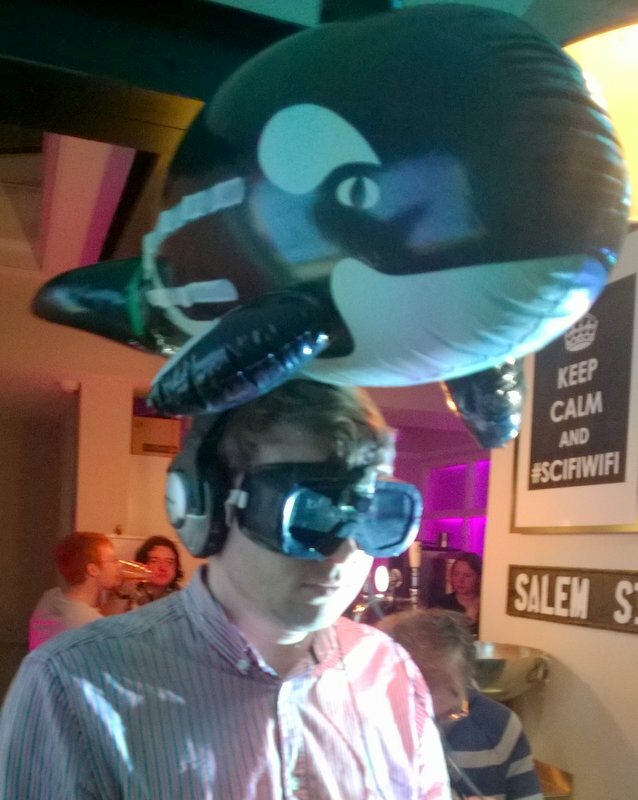 You don’t have to wear an inflatable whale on your head to understand the importance of play, but it helps. On the 13th of March Playful Leeds welcomed Nikki Pugh to Leeds to talk about her work on playfulness. After her talk, NIkki blindfolded us and replaced our sight with a custom sonar system she’d built herself with an Arduino. It was a wonderfully weird spectacle, especially in a converted Methodist Chapel in South Leeds. Nikki told a lot of great stories but two have really stuck with me. The first was about Nikki’s experience of creating Birmingham’s first space bringing makers and tinkerers together. She pushed to give it a fun name and the group settled on fizzPop, an ode to West Yorkshire’s own Joseph Priestly, the discoverer of Oxygen and creator of Soda Water. The name was not well received by some. They wanted a hackspace called a hackspace, with a serious image and no fizzing or popping at all. In the end Nikki got her way and fizzPop is still a leading hackspace in the UK. And the people who moaned at her? The people who endlessly petitioned to name the project less playfully? Very few of them ever turned up in person to make their case or join in and none of them set up a rival hackspace. There’s a lesson in that. To understand the second killer point that NIkkia made you need to understand what kind of stuff she does. She has sent people exploring familiar surroundings with an over-sized GPS-enabled boombox she has programed to encourage them to take small risks and unusual paths. She has attached table-tennis nets to empty market stalls and given out bats and balls to passers-by. She got me to put an inflatable whale on my head. Common to everything, Nikki is fanatical about inviting people to play more, whoever and wherever they are. The day after Nikki’s talk I realised that the experiences that Dan and I build at imactivate are always sold as interactive. We take a physical object, and add some extra digital content to it that can be uncovered with a smartphone. Often that content is serious, the objective is clear, and interactive is the right word to use. Sometimes the content is fun and its purpose is unclear. So we’ve started describing some of our projects as playful, and commissioning artists to work on playful content, not interactive content. It’s a new way of thinking about what we do and I can’t say yet whether that matters or not. But when someone gives you an invitation to play, it seems rude not to give it a go.